T-Mobile's G1 with Google handset, the first to show off the hotly anticipated Android OS, will be available in the UK from 30 October. There have been over 25,000 pre-orders for the G1 in the UK alone, while worldwide the demand for the handset has even exceeded some analysts' predictions. 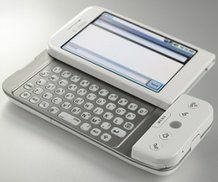 It's estimated up to 600,000 T-Mobile G1 handsets, which are manufactured by HTC, will be sold by the end of the year, which would outstrip even the level of demand for the first Apple iPhone. The 3.5G / Wi-Fi connected handset comes pre-installed with a 2GB memory card, but we've yet to find out whether video playback will be added to the final handset, as the prototype we saw working was sadly lacking this crucial feature.